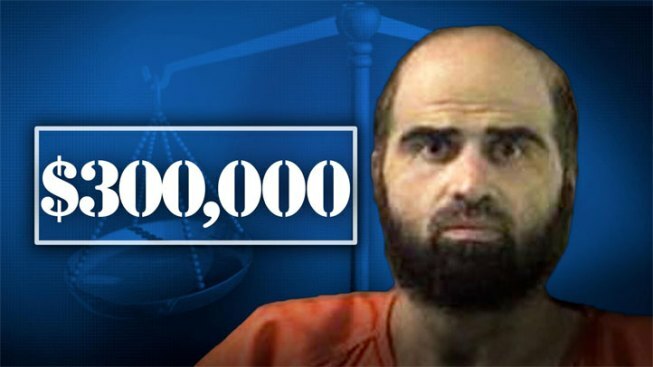 As NBC 5 Investigates first reported, Nidal Hasan collected nearly $300,000 in his military salary while awaiting trial for the 2009 shooting rampage at Fort Hood, but his attorney said nearly all of it has been given to charity -- likely making it impossible for his victims to get any of it. Hasan's civil attorney, John Galligan, wouldn't disclose any information about the charities or proof that donations had been made. An Army spokesman said the military can't get back the money because Hasan, like any other service member charged with a crime, continued to receive his military salary until he was convicted last month. "The great bulk of his income has been donated to charity," said Galligan, who also once represented Hasan in the criminal case. "There's really virtually no money in any bank that I'm aware of. There's really no property holdings." The money would likely only be a fraction of what Hasan's victims and their relatives still need. Some have struggled to find jobs or pay medical bills since Hasan killed 13 people and wounded more than 30 others when he opened fire inside a crowded building on the Texas military base on Nov. 5, 2009. But his salary carries symbolic value. "It's not about the amount. It's about principle," said retired Staff Sgt. Alonzo Lunsford, who was shot seven times by Hasan and testified at his trial. "During this time the man was incarcerated, he was still drawing full military pay, full military benefits. That money was spent on him, and we were denied -- still -- certain benefits." Lunsford wants Hasan's salary to go into a scholarship fund for victims' children. He also is among the victims suing the government, in a lawsuit that also names Hasan, in an effort to get the shooting characterized as a terrorist attack rather than workplace violence. The designation would make them eligible for more benefits and recognition that they say they deserve. But whether they can get any money from Hasan is unlikely, according to the military, Galligan and a lawyer for the victims. Along with a lack of bank accounts tied to Hasan, FBI agents found little more than a table, a folding chair and a prayer mat in his apartment after the shooting. Given his rank as major, Hasan collected more than $7,000 a month in salary, according to the Army. That salary was subject to federal taxes, but Texas doesn't collect a state income tax. His paychecks were revoked 14 days after he was sentenced to death last month, per Army regulations. But his case had dragged out for nearly four years, in part because he was forbidden to plead guilty to charges after prosecutors refused to take the death penalty off the table. Hasan's expenses after the attack were limited, according to Galligan. About $10,000 was spent to hire a medical specialist to assess Hasan's life expectancy. Hasan was paralyzed from the waist down after being shot in the back by a Fort Hood police officer during the rampage. Hasan represented himself at his trial, and although he told the judge the shootings were necessary to protect Islamic and Taliban leaders from U.S. troops overseas, he presented no evidence or witnesses. The American-born Muslim had government-funded defense lawyers to help him, and Galligan said he has worked for Hasan mostly for free. Army spokesman Lt. Col. S. Justin Platt said the military can't get back the money Hasan was paid while behind bars. Hasan's sentence included a dismissal from the Army and a forfeiture of all pay and allowances. Galligan said Hasan's paychecks were not deposited in a bank, but he declined to say how Hasan handled them. He refused to hint at the type of charities Hasan allegedly helped. Reed Rubinstein, an attorney helping victims sue the government, said he was exploring ways to get any money or assets he could out of Hasan. But he acknowledged that those efforts might not succeed. "We have no way of knowing what he did with that money," Rubinstein said. "It's quite possible and likely that the money is long gone."